The project Towards a Mobile Hybrid Cloud is an activity in the Computing in the Cloud action line of EIT ICT Labs. It is a continuation of the 2012 project Towards a Mobile Cloud and has the goal to deliver concepts and tools for managing specific aspects of hybrid cloud environments, including the optimization of quality of service and resource usage, and the manageability of heterogeneous environments. 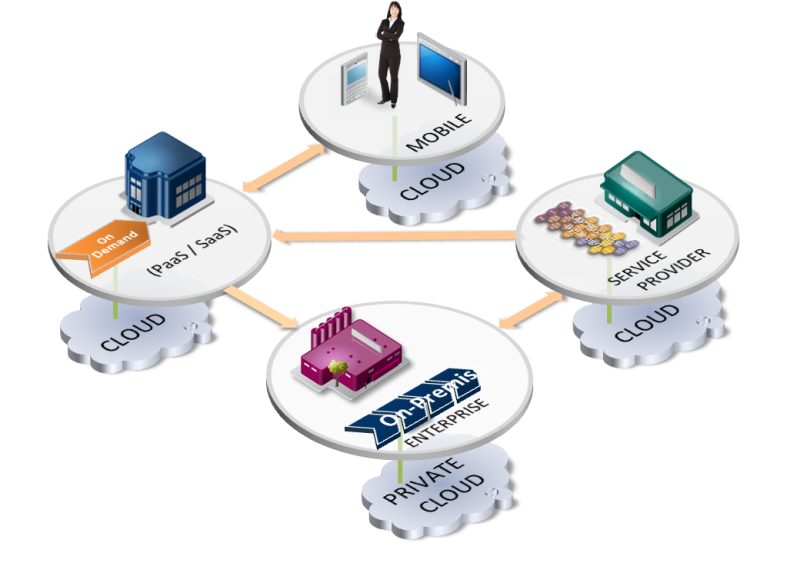 The activity aims at providing management tools for optimized usage of resources in mobile, hybrid clouds. It builds upon the elasticity benchmarking tools and frameworks developed in the 2012 activity. Resource management for mobile, hybrid clouds will include data centre, network and mobile devices and will lead to higher utilization, better quality and reduced costs. The underlying PaaS environment shall provide resources in an elastic manner according to the workload induced by mobile devices. Mobile devices shall manage their resources by deciding in coordination with the PaaS in a context-dependant manner at run-time which parts of the required functionality shall be executed on the device and which parts shall be executed in the open or private part of the enterprise cloud. The PaaS managing the interconnecting network must dynamically assign network resources, according to the fluctuating traffic requirements and network capabilities. The figure below shows different kinds of clouds, forming an overall hybrid cloud, in this setup and how they are interrelated. While resources (computation, storage, network) are exposed through IaaS interfaces by different vendors, it is the PaaS that decides which resources (e.g. device or datacenter computation, or using different link bandwidths when connecting through mobile telecommunication or via WIFI links) to allocate to which application (and their expected QoE). Without a PaaS manager, cloud applications would need to allocate their resources in isolation resulting in suboptimal decisions and also putting the programming and configuration burden on the application creator. Software defined networks offer new ways for influencing network qualities and resources in the network, eventually according to business and application priorities. Hybrid clouds become more and more the norm in modern cloud computing. While not totally new as a trend they reinforce the overall direction of our activity and are basically reflected in all research tasks. The software for the Social Devices Platform (SDP) developed by Aalto University will be made available on Github at http://socialdevices.github.io/.